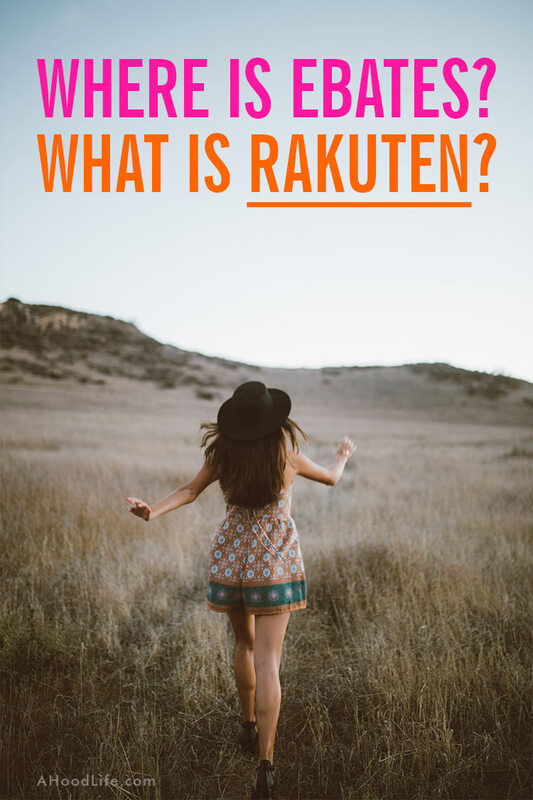 What Is Rakuten? And How Does Rakuten Work? Home What Is Rakuten? And How Does Rakuten Work? Disclosure: I am compensated for purchases made through some links on this site. Click for details. What’s more fun than shopping you ask? Getting paid to shop!! Don’t think it’s possible? Well, it is with Rakuten! What Stores Can You Shop at with Rakuten? How Does Shopping with Rakuten Work? What is Rakuten? They are a Japanese internet marketing company. One of the largest internet marketing companies in the world. 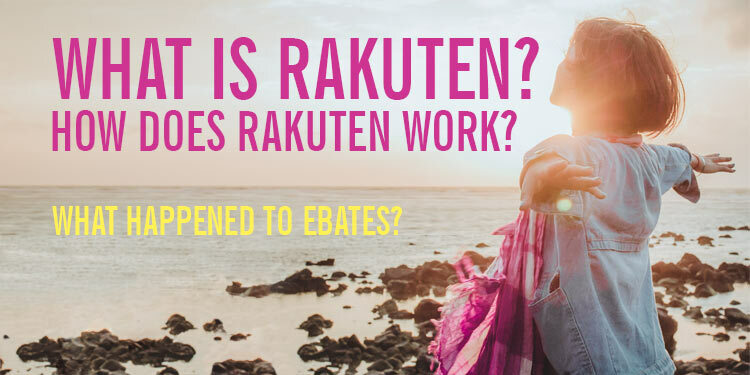 Though Ebates was acquired by Rakuten, Inc. in 2014, they continued to operate separately. Not any more! The two companies have fully combined forces under the Rakuten name to bring us a better product! We’re told bigger and better things are on the way! Can’t wait! All aspects of your Ebates account and shopping are the same other than the new name, new web address, and for those who provide referrals, your referral link has changed. 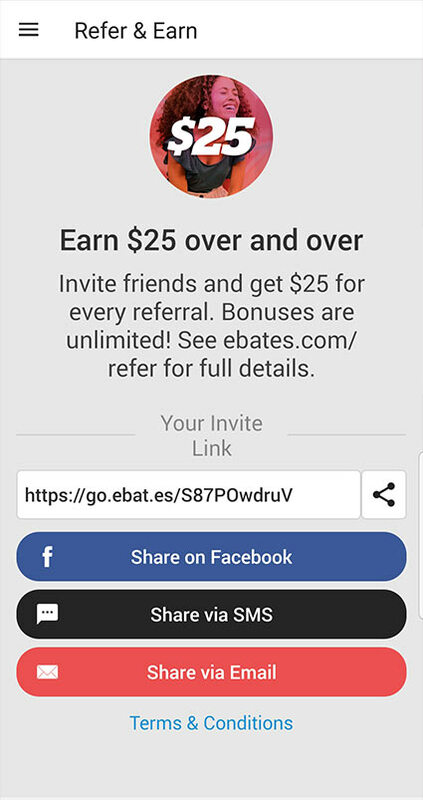 For now, the Ebates.com forwards to Rakuten.com and so does your referral link. Rakuten means “optimism” in Japanese and I’m very optimistic about these changes. The combining of these companies means expanded capabilities. I wonder what new opportunities for saving will become available. Rakuten is an affiliate marketing business. This means that companies pay Rakuten to send shoppers their way. You go shopping at a store through a link on Rakuten, the store pays Rakuten a referral fee, and Rakuten gives you part of their payout. Everyone wins! All I can say is WOW!!! I wish I would’ve signed up years ago! In a year and a half, I earned $525.56! Cha-Ching!! Not too shabby for simply clicking a button while shopping online. So… The burning question… Is Rakuten a scam? Nope! Not at all! 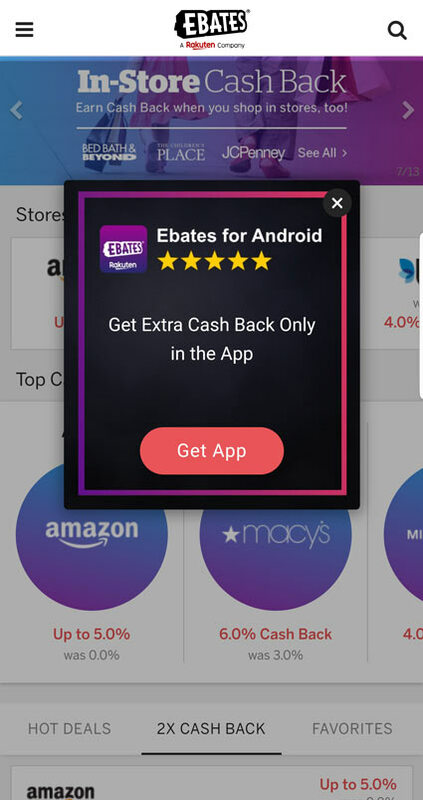 In 2014, Ebates was acquired by Rakuten, Inc., a highly reputable internet marketing company that’s also one of the world’s largest internet companies. 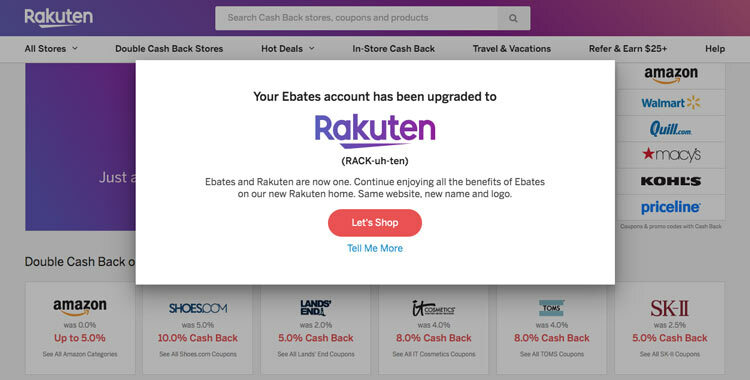 As of April 9, 2019, Ebates is now fully integrated into Rakuten. Ebates had been in business since 1999 and Rakuten was founded in 1997. Rakuten has had an A+ rating with the Better Business Bureau (BBB) with hundreds of positive customer reviews on the BBB website. They have more than 10 million members signed up for the cash back program. They’ve paid out over $800 million in cash back! First things first. You’ll need to sign up for a FREE Rakuten account. It’s really simple. Go to Rakuten.com, and create an account with our sign up link. Using our sign up link will earn you the $10 Rakuten sign up bonus I was talking about. What’s the Rakuten Sign Up Process Look Like? 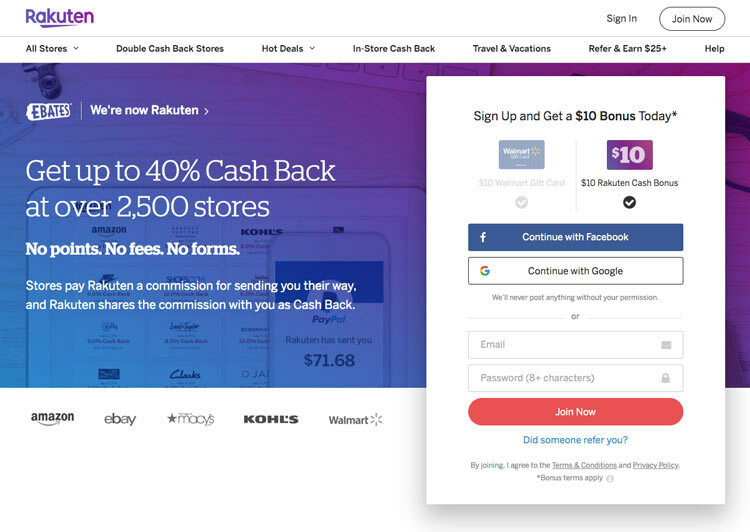 At the top of the sign up box, pick whether you want your free $10 sign up bonus as a $10 Walmart Gift Card or $10 Rakuten Cash Bonus that will apply to your cash back. I recommend the Rakuten Cash Bonus. It’s $10 that you can spend however you want! As a new member, you qualify for the free Rakuten welcome bonus by making $25 worth of qualifying purchases within the first 90 days. Woohoo!!! FREE money right out of the gate! Just to be upfront, Rakuten will send me a referral when you qualify for the $10. When I signed up, my friend who introduced me to Rakuten (Ebates at that time) received $25. You, too, can refer friends and family and get $25 referrals! How cool is that?! When you help someone get cash back for shopping, you get money too! The opportunities are numerous with over 2500 Rakuten affiliate stores to choose from! We’re talking major retailers like Amazon, Target, Walmart, Walgreens, Macy’s, Belk, Kohl’s, Old Navy, JCPenney, Bath and Body Works, and so many more. You can get cash back on clothes, food, entertainment, office supplies, auto, pets supplies, health and beauty, travel and vacations… The list seems endless. You won’t feel limited in your savings options! How Does the Rakuten Shopping Experience Work? Now that you’ve signed up for your free account you’re ready to shop, save, and earn! When you’re ready to shop online, head over to Rakuten.com and check out the deals. There’s more for you than just the cash back rewards. They also make it easy to save with daily deals, coupons, and promo codes too! Remember to go through Rakuten before making a purchase. It’s how they track your purchases and know how much cash back to send you. If you don’t go through them first, you won’t earn your cash back reward. 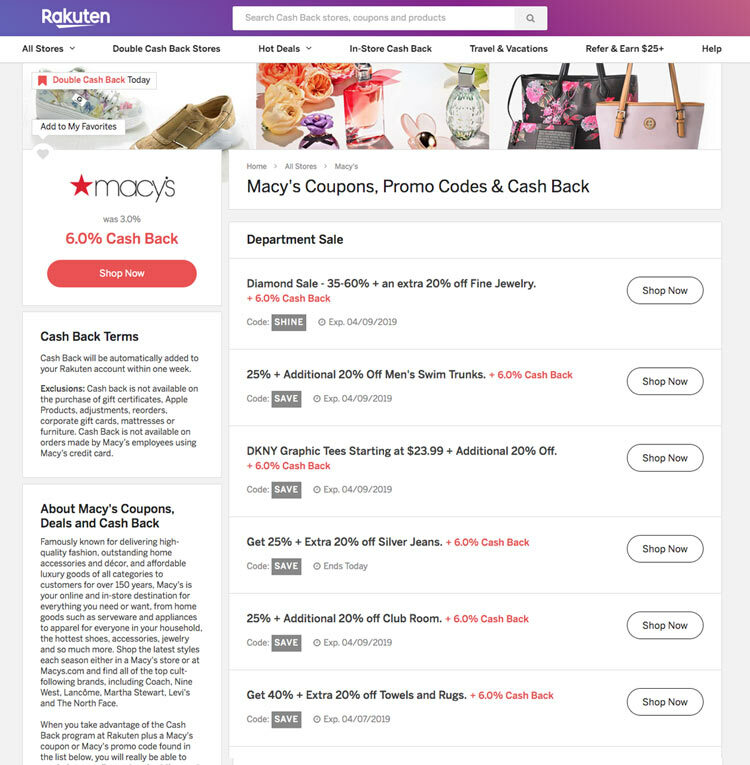 After you click on the Macy’s link you’ll be taken to a Coupons, Promo Codes & Cash Back page. 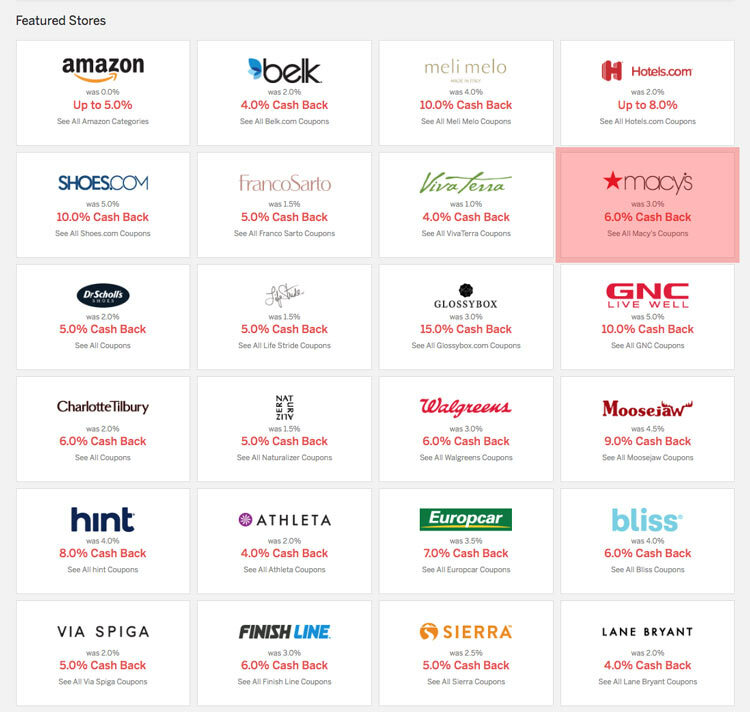 On the Coupons, Promo Codes & Cash Back page, check out the discounts for extra savings and click through one of the “Shop Now” buttons to activate your savings and cash back rewards. You’ll be taken to a verification page like the one here before it forwards you on to your store. There’s nothing more to do. Just shop at your chosen store like you normally would. Rakuten is far more than just a cash back site. They also save you money by helping you find your best deal, coupons, discounts, and promotions. If you happen to have a discount that’s not listed on Rakuten, just enter it at checkout like you normally would. Discounts and cash back! Rakuten has you covered! Quick and simple! Rakuten has a Double Cash Back section with awesome deals! Companies are always giving members bonus rewards. 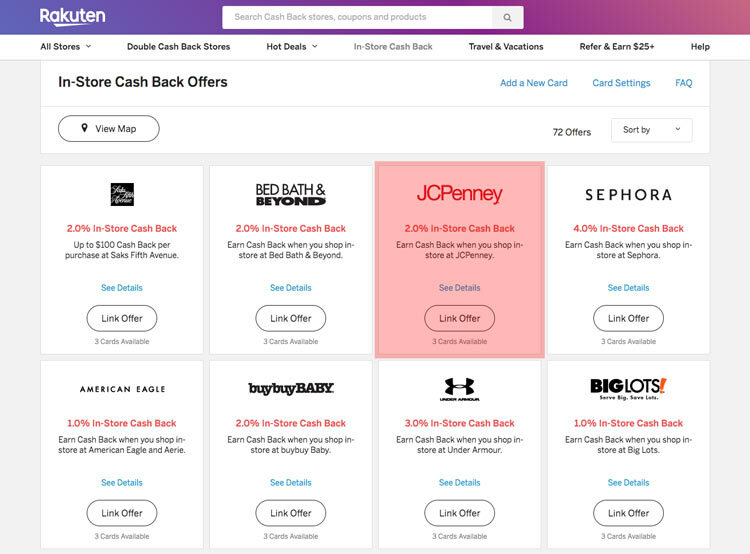 Be sure to check the Double Cash Back section often or sign up for the Rakuten email list. They’ll keep you up to date on Double Cash Back deals. Rakuten Hot Deals provides you a list of stores offering the best deals. Here’s where you can find coupons, promo codes, and daily deals like buy one get one free (BOGOs), free gifts, free shipping, gift cards, even stores willing to let you buy online and pick up in store. Rakuten has partnered with companies like Expedia and Travelocity for travel and vacation discounts! You can get cash back and discounts on flights, hotels, rental cars, and more by booking through Rakuten! On the Rakuten site, simply click “Travel & Vacations”. From here you can search when and where you’re going. You can even get discounts on package deals that already have awesome prices including flight and hotel bundles. I’ve booked one trip using Rakuten so far. The only reason I haven’t used it more is just because I haven’t needed to… The hubby and I are planning a trip as we speak and I’ve been searching Rakuten for options! I’ll be using them for sure! Comparison shopping is a breeze with Rakuten. Just search for the item you want and They’ll give you a list of stores and available discounts. How easy is that?! 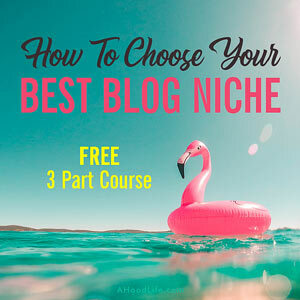 Saves me tons of time I would’ve wasted on multiple sites trying to find my best deal. To make the process as easy as possible, they also have a Rakuten Button for your web browser and a Rakuten App for your mobile devices. The free Rakuten button is a browser extension that’s added to your Chrome, Firefox, Safari or Edge desktop web browser. This handy little tool notifies you if there’s an offer on a site you’re visiting. All you have to do is click the “activate” link. This eliminates the step of going to Rakuten.com before you shop. The browser extension also alerts you of other discounts and promotions the store offers! I’ve had to train Steve to use Rakuten. He lost out on cash back and discounts before installing the browser extension. In his hurry, he’d forget to go through Rakuten.com first. He finds this option easiest. You might too! If you’re a cellphone shopper, you’ll want to make sure you get the Rakuten app for your phone and other mobile devices too! There are apps for both Android and iOS devices. Access to mobile-exclusive sales and coupons right at your fingertips. The Notification Center has app-only deals. Click on the bell icon in the upper right of the app to check out the savings. 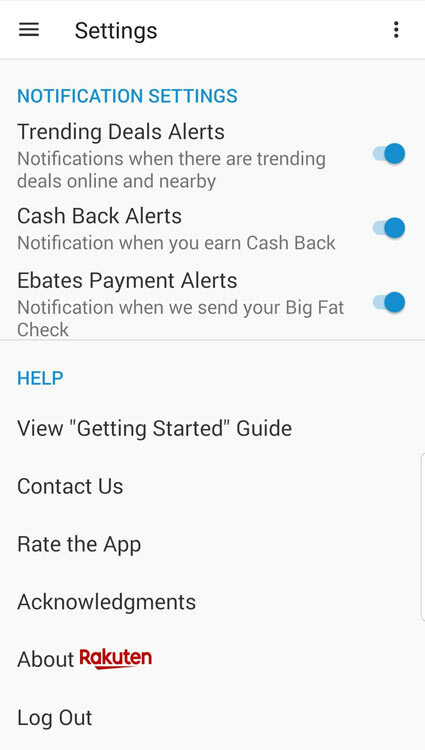 The app has push notifications that let you know about deals, cash back alerts, and payment alerts so you don’t miss out. Just make sure you turn on your phone’s notifications for the app. With the refer-a-friend feature, Rakuten makes it super simple to refer friends and family. It’s much like “Refer & Earn $25+” on the website but with a few more sharing options. Share your invite link with a friend by way of Facebook, text, email, or other. When your friend signs up and makes a qualifying purchase, they’ll get $10 and you’ll get $25! Free money!!! Woohoo! Want to keep up with the latest trends and must-haves? Rakuten has all you’d ever want in The Trend Report curated by ShopStyle. Check out the hottest styles and get cash back on your purchases at your favorite stores. Keeping up with the latest styles and trends has never been so easy! Is Rakuten Only for Online Shopping? While Rakuten is well known for online shopping, you can find in-store shopping rebates as well. 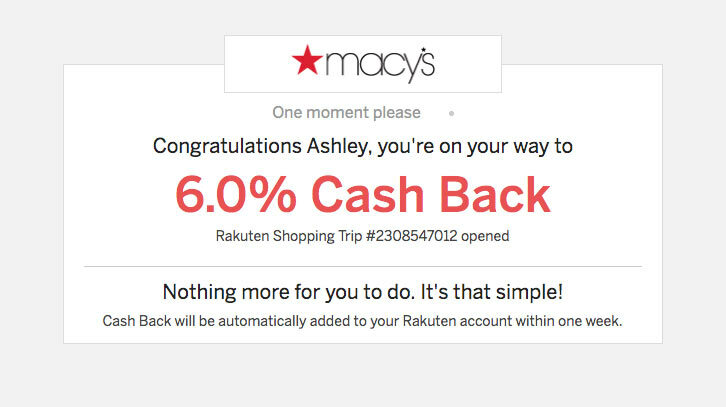 There’s an “In-Store Cash Back” link at the top of the Rakuten web page. If you find an in-store offer you want to use, just click “Link Offer” and link it to a credit or debit card of your choice. When you make a purchase using your card at the chosen brick-and-mortar store, it automatically applies the offer and cash back reward! 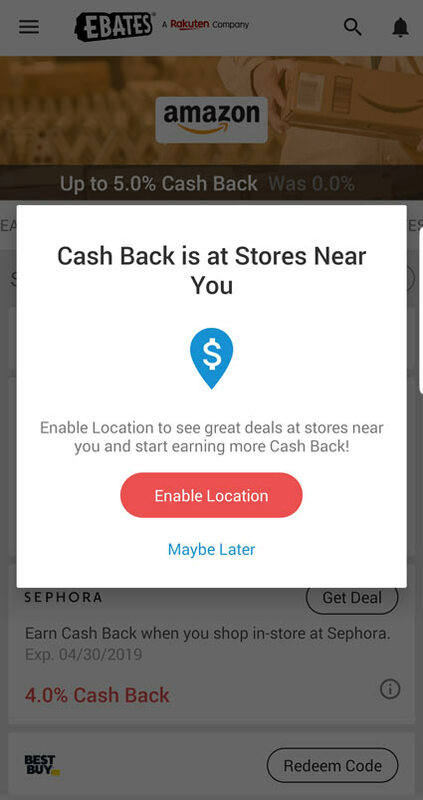 Already shopping in a store that offers in-store cash back? You can use their app to link your card to the offer while in the store! To earn In-Store Cash Back with your debit card, you must run the card as credit and sign for your purchase. Do not use your PIN. If you run your debit card and use your pin like you normal, Rakuten does not receive notification of your transaction and you won’t earn any Cash Back. Helpful Tip: Get the app for your cellphone and turn on the geo-notification feature. This way you won’t miss out on any cash back when shopping at brick-and-mortar stores. To get the most bang for my buck, I shop online whenever I can, but sometimes I need to see something before buying. I’ve gone to try on clothes at the store, then made my order online through Rakuten with in-store pick-up, or site-to-store shipping. There are times when your item will be ready for pickup within an hour. Many stores offer in-store pick-up, or site-to-store shipping free of charge. I’ve done this at Kohl’s, Wal-Mart, Lowe’s, and Old Navy… so far. So, you’ve been shopping through Rakuten and now you’re asking yourself, how do they pay you? There are several options for receiving your cash back. You can choose PayPal. You can have a check sent to you. Or you can get a gift card. Your cash back rewards are disbursed on a 3-month schedule… February 15th, May 15th, August 15th, and November 15th. It doesn’t matter when you join, the dates are the same for everyone. As long as you have at least $5 to be cashed in, you will receive a rebate payment on these dates. If you have less than $5, it will carry over into the next pay period. With the gift card payment option, they offer up to a 15% added bonus to your already awesome cash back loot by opting to receive your “Big Fat Payment” via an e-gift card. There are numerous stores to choose from, with varying added bonus percentages. On top of the added bonus, with the gift card option, you receive your payout days before you would with the other payment options. It’s a win-win if you ask me! I have opted for the gift cards twice now. Once at Old Navy and once at Kohl’s. They e-mail you the e-gift card and you can print it out to use in the store, but why would you do that? I opted for using them online because guess what… you can earn even more cash back by using the money you earned from Rakuten!! 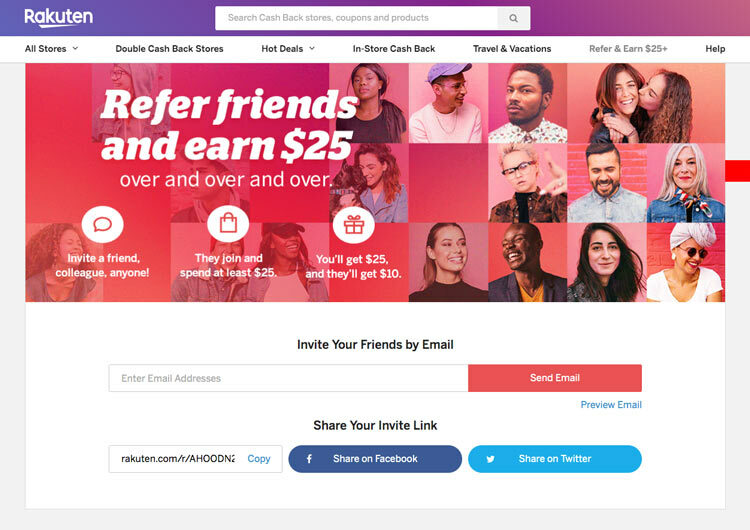 Make Money with the Rakuten Referral Program! You can make extra money helping your friends and family save money on things they’re already shopping for online. Once you’ve created your free Rakuten account, you can invite others to join in on the saving too! Once they’ve made a qualifying purchase, they get $10 for joining and you get $25 for referring them! How cool is that?! Free money for helping others! You can share your Rakuten referral link with your contact list, Facebook, Instagram, Twitter, Pinterest, and other social media platforms. I originally found about Ebates through a coworker who was excited about her cash back rewards. When I signed up through her invite link, I got the $10 sign up bonus and she got a nice $25 referral. Since signing up, the deals have saved me $100’s and I’ve been sent $100’s in cash back! How many contacts do you have on social media? How many many of these connections would love to save on shopping? 10? 50? 100? Ummm… 100 referrals would be $2500 in your pocket!!! That wad of cash would feel good too! What could you do with that kind of money? Shopping spree? Pay down that student loan or other debt? Now that’s a side hustle I can get behind. No selling. Just helping others keep more of their hard earned money. Rakuten Review and How-To Conclusion: Totally Worth It! Not only is Rakuten a hassle-free way to save money. You can earn money and it’s fun! I get so exciiited when I find a great deal. Rakuten keeps me smiling! Saves me money at stores I already shop at. What are you waiting for? Get signed up for your Rakuten account and claim your rewards! Shopping doesn’t get any better! How much have you saved with Rakuten? We’d love to hear in the comments below! I’ve never heard of this site but look forward to checking it out. Thank you for the useful information!! Hi Cherokee! Thank you for reading and commenting! You’ll love Rakuten! The cash back and savings are great! I’m looking for new affiliates to go with and never even considered these guys. I’ll definitely check them out. Thank you! Wow, what a thorough article! I am a Rakuten affiliate, but haven’t used those features yet. Hey Mary! The Rakuten app and browser extension for adding the pop up button are two of my favorite features. 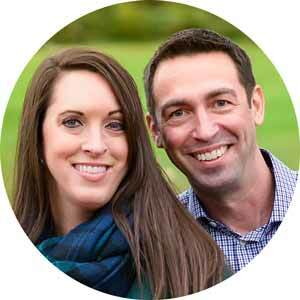 Steve, 23 year veteran of online entrepreneurship, and wife Ashley, here! 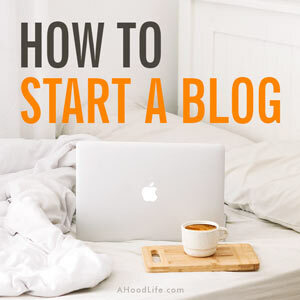 We want to help you create a successful blog and a financially independent life you'll love! AHoodLife.com is a participant in the Amazon Services LLC Associates Program, an affiliate advertising program designed to provide a means for sites to earn advertising fees by advertising and linking to Amazon.com.